Note: If you want help with best practices, contact webservices@cornell.edu. The web services group won’t write code or change your content, but they can assist you with best practices. 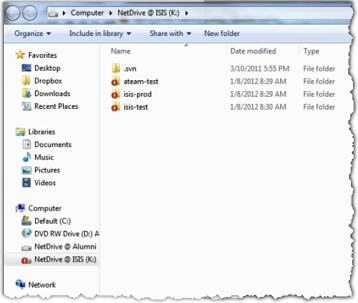 Two common methods for connecting to a server using WebDav are through a WebDav client (preferred) or by mounting a drive (less secure). WebDav Client Method (Preferred): A WebDav client is a program that allows you to connect to a remote server. You can choose to always connect when you turn on your computer (reduces the boot speed for the computer) or to connect just when you need to use the server. When you connect to the server, the server appears as an additional drive. Tools such as Dreamweaver will indicate when you are connected. Some WebDav clients are free, some cost small sums of money. See the list of WebDav clients below. Mounting the Drive Method (Less Secure): You can mount the server as an external drive so that it shows up as an icon on your desktop. This is less preferred than using a WebDav client because it creates a security vulnerability. (Anyone who can use your machine can get to the server.) It is also more complicated to set up. The method for mounting drives differs with each operating system and even between versions of the same operating system. Instructions for mounting a drive are in the help for your operating system. This address is the one you use to connect to your site to work with the files. For most servers, when you connect with WebDav, you'll see the htdocs folder, which is a standard part of sites provided by the web services group. The htdocs folder might include files that belong to the entire website. (For some older, legacy systems, you start in a shared area that many people can see. From there you navigate to your own folders. The idstatic.cit.cornell.edu server works this way. The best practice for file structure is to place all sites at least one level down from your htdoc folder. For example, for two separate sites about apples and oranges you would create folders apples and oranges. For a site about different types of apple, you'd make subfolders under the apples folder. WebDav folders follow the Windows or Unix rules for permissions, naming, etc. depending on the type of server they are on. (For a windows server, the folders follow Windows rules. For a Unix server, the folders follow Unix rules. The image below shows a Windows machine connected via a WebDav client to a Unix ColdFusion server. Although this looks like a Windows system, the files are on a Unix server. They must obey all the Unix system rules for naming, permissions, etc. Note: If you connect from a Windows machine to a Unix server, you'll see commands available to create different types of files. Although many options are visible, only Folder and Text Document are usable on a Unix server. Note: Any file you create or edit must be plain text. Some text editors offer the option to save as Unix text. This is preferable. You can use .wdaccess files to control who has permission to view or change your files on the server. Put a .wdaccess file in the htdocs folder, and another one in any folder for which you want to maintain different permissions. Warning: If you don't create a .wdaccess file, anyone can look at or change your files. The "." is required to start the name. The CU WebAuth utility uses the information in the .wdaccess file to enforce access to the folders. Permissions are inherited by sub-folders, but can be overridden by another .wdaccess file. Edit .wdaccess files using a plain text editor. Many clients have a .wdaccess editor to make it easier. Note: Changes are immediately visible, so it is best to edit on the desktop then transfer the new file once you know it's correct. 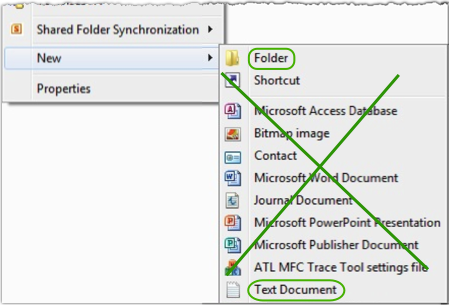 Following is an example of how a site might use .wdaccess files to control access to folders. An administrator can log into oursite-webdav.kproxy.cornell.edu. Folder_C = Administrator can see and make changes in this folder. A developer can log into oursite-webdav.kproxy.cornell.edu/Folder_B and oursite-webdav.kproxy.cornell.edu/Folder_C. Folder_B = Developer can see and make changes in this folder. Folder_C = Developer can see and make changes in this folder. The last two lines are used to control permissions. Warning: If you are not in the .wdaccess file as a netid or as a permit you will lose access to the file and will not be able to edit the .wdaccess file itself. You would be locked out. Copy the sample file to a text editor. Separate permits or NetIDs with a space. To make a new group on a hosted server, send request to webservices@cornell.edu. You can add NetIDs instead of using AD groups, but this is not recommended since it results in extra maintenance, especially for large numbers of people or multiple .wdaccess files. Be sure that you are included in the AD group or that you add your own NetID. If not, you will not be able to access your own files. Save the .wdaccess file, and then copy it to the folder on your site.